Does your client or prospect need to consult with others in order to make a decision? Are they indirect and avoid conflict? Do they go quiet if they disagree, rather than speaking directly? Then you are probably working with an Amiable. 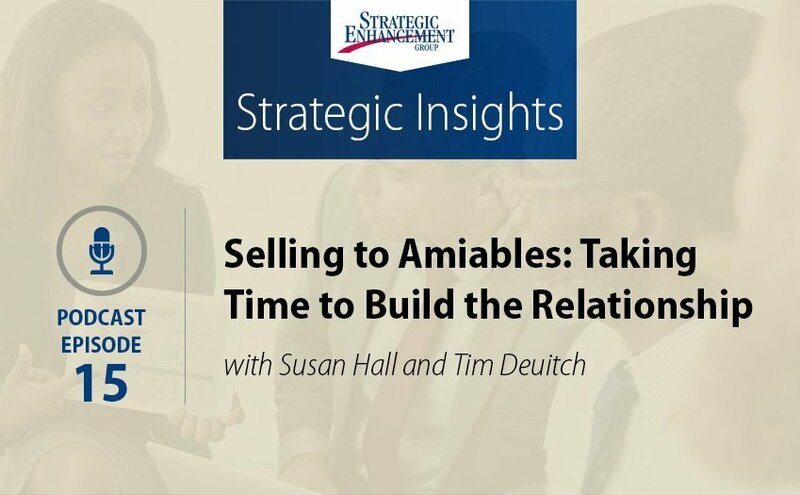 Susan Hall and Tim Deuitch discuss strategies to be more versatile and successful when selling to clients and prospects who display the Amiable social style. 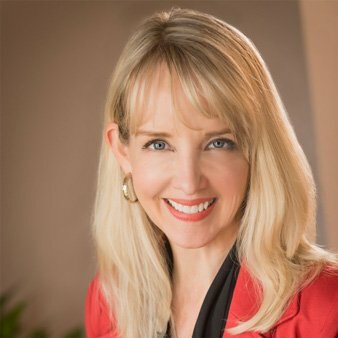 Susan Hall: 00:01 Hello and welcome to Strategic Insights Podcast brought to you by Strategic Enhancement Group. 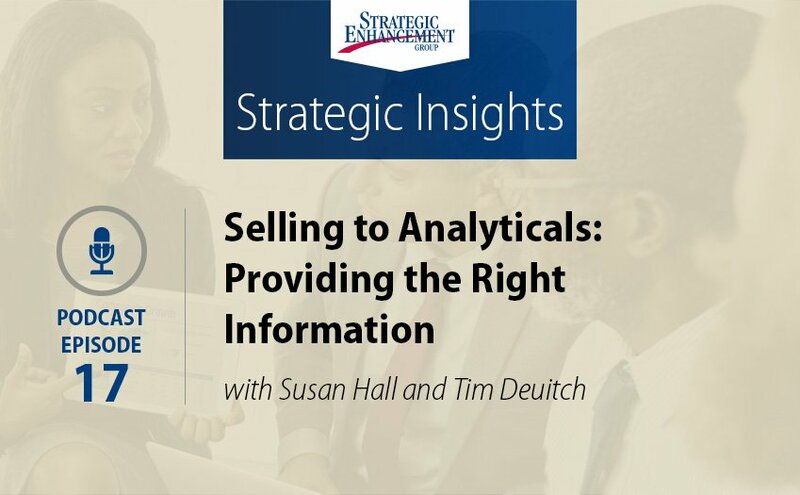 I'm Susan Hall, Vice President Business Development & Performance Improvement, and today I'm joined by Senior Performance Consultant with Strategic Enhancement Group, Tim Deuitch. Welcome, Tim. Tim Deuitch: 00:16 Hi Susan, how are you today? Susan Hall: 00:18 I'm doing great. Always great to have you. This podcast is one of a series that addresses the challenges we feel when working with clients and coworkers who have different communication styles from our own, and there are four styles that we'll be speaking to. 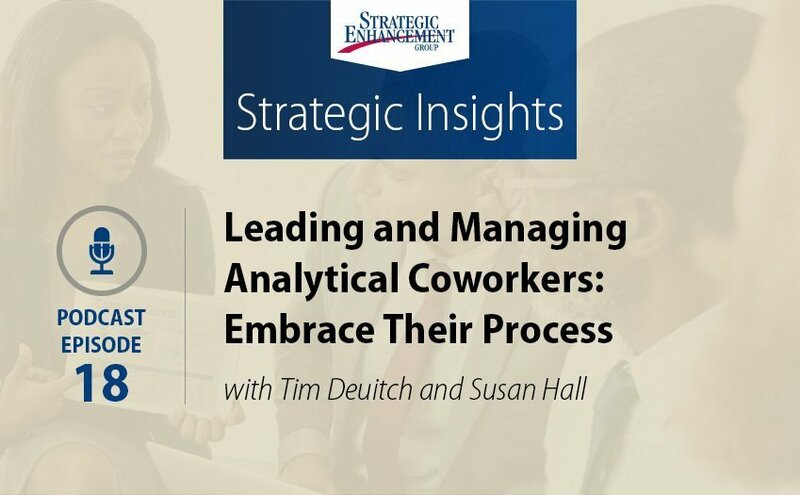 The Analytical style, which is task focused, they're deliberate, thoughtful, and they appreciate process. The Expressive style, which is people focused, verbal, they tend to think out loud, they're creative, and also demonstrative. The Amiable style, which is our focus today, are people focused, open-minded, and flexible. They prefer harmony and they really avoid conflict. And the driver, who is task and results oriented, gets to the point and wants you to use their time wisely. Each podcast will address one of these styles and we'll describe the traits and motives of the styles, as well as some practical tips that we've learned from experience and research in terms of engaging these types. Today, we're going to be focused on the Amiable client and the challenge and opportunities that salespeople often have when they work with clients of this style. So Tim, let's talk first about the characteristics of the Amiables. These are friendly, people focused individuals. They tend to have a relaxed pace and place a high value on building trusting relationships. Amiables greatly emphasize ensuring that everyone is on the same page and they work hard to make sure that they're gaining all key stakeholders input to consider before they make a decision. They tend to be deliberately paced in their communications and they asked questions as a way to influence people as opposed to making more declarative statements. Instead of saying, "Hey Tim, that tie is all wrong with that shirt." An Amiable might ask, "Tim, are you sure you want to wear that tie with that shirt?" or "Have you considered this tie to wear that shirt?" Tim Deuitch: 02:16 I might have even heard that before in my life. Susan Hall: 02:20 This is a client who values harmony and positive morale across their organization. They can be gentle in voice and tone and are often excellent listeners. They don't like to feel rushed and are uncomfortable with conflict and relationship tension. In fact, they may go quiet during tense moments. Tim, what are some of the other behavioral cues that you've seen from Amiable clients? Tim Deuitch: 02:43 That's a great list of characteristics. I would probably add that the Amiable client is a very considerate thinker. They don't mind giving up control and as a client that's working with you as a salesperson, they will ask you questions back and appear to take a genuine interest in the meeting you're having with them, the phone call, and so forth. They tend to want to be supportive, they want to make things work. If you're recommending that they consider an idea, a product, a strategy, they tend to take a genuine interest in that. Susan Hall: 03:32 Yes, absolutely. Let's discuss selling to an Amiable client and some of the things that are important to know and to keep in mind. I know two things that I've learned over time, one is, take the time to build the relationship, make time to discuss personal issues in a way that's comfortable for both of you, obviously. Amiables tend to be less formal, they're easy going, empathetic, they have moderate pace, and they prefer to work with business partners who are as well. I think a second thing that I've learned, is be prepared to do your discovery, and advocate, or present your solutions to multiple stakeholders before a decision is made. 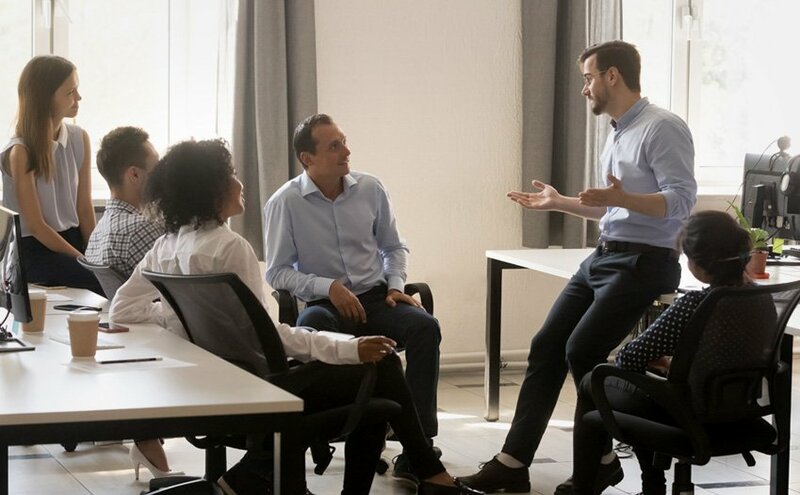 Ask the Amiable about their decision making process, but also make sure to find out who else is involved, or who else should be involved, and be prepared to have this conversation with other key stakeholders to get their input. That will make that Amiable feel much more comfortable and confident with the decision. How about you Tim? What are your suggestions? Tim Deuitch: 04:37 Well, one of the things I appreciate most about a customer who's Amiable is their sensitivity to the full dynamics of a situation or a decision. They're very mindful of the effect on others in the organization. If they were to make a decision or suggest that, "Why don't we bring this product in," or "Why don't we install things in this way?" They filter that decision through the lens of, "Will this work for others?" It's a double edge sword though. We appreciate that because they're helping us understand the full dynamics. Even when we wouldn't necessarily ask that question about their company as a client, they will bring us there, and of course, it's double-edged. Because at the same time, if we want them to be more assertive, even if they're the decision maker if they're going to use a consensus style of decision making when we would love for them to just decide. We have to embrace the fact that by the careful path they'll take, they're actually signaling to us that if we stay with them through the end of their thought process, we're going to probably have a much richer relationship when it comes to them buying our products, buying our services, and so forth. Susan Hall: 06:09 Exactly, and also their focus on engaging the stakeholders within the organization sets you up for success as well, because they've taken the time to get multiple perspectives and to consider others' perspectives and opinions. There's a higher level of commitment to whatever the solution is that you're going to be implementing. You've segued beautifully, Tim, once again to the next topic, which is typical frustrations or challenges that we sometimes encounter when working with Amiable customers. I think it's important to say here, that every style brings points of tension, and despite their pension for harmony, Amiables are no different. Because of their style, they tend to be indirect, avoid conflict, they may go quiet if they disagree, rather than speaking directly. I think we've already alluded to this a bit, but I've learned that it's especially important to continually check the pulse of their views and their perspectives. Under tension, Amiables can sometimes acquiesce, that is they give in. They might comply because they don't like the energy, the conflict, the tension, but you haven't really gained their support, and that problem doesn't go away just because they're not articulating it to you, it just goes underground, and I can guarantee you it will resurface, sometimes when you least expect it. Continually checking in, "Mary, how do you feel about this?" or "Do you have any concerns?" Just very gently, if you're noticing any hesitation, make sure that you're going a little bit deeper to try to get to the real issue. The more trust you have, the more freely they will share with you. Tim Deuitch: 08:01 Yes, it's absolutely true. I think what I always say about working with Amiable customers is that, and this is the frustration, sort of wrapped around a suggestion. An Amiable customer often looks like the first person to buy in to the idea, or the progression of the discussion taking place, the sales cycle that might be going on. They look like the first person to buy in because they want things to work, but the reality often, at least for me, is that the Amiable is actually the last person to buy in. The reason is because they're going to filter the commitment to a purchase, or to an idea. They're going to filter it through the lens of their coworkers, and their bosses, and so forth, through the people that influenced them internally. They can be, frankly, kind of fool's gold at the beginning, because they'll be excited about the idea presented, or excited about a product, they will light up, but the reality for them is, it will be at the end when they buy in, and that buy in will depend on the degree to which others buy in, and that can be frustrating. That's why we put it into this piece of our discussion because that can be very frustrating to a salesperson. "I thought we were on the same page." You were, but there are others who need to be on that page too. Susan Hall: 09:38 Exactly. Expect sometimes, a longer sales cycle, I think, because of that, or at least a more thoughtful sales cycle that includes multiple perspectives. Amiables tend to be more cautious, and it's important to minimize risk from their perspective. Let's move to some very specific actions and tips that salespeople can do to make the most of working with the Amiable style of a client. As we've already said, a comfortable Amiable client will be honest, caring, supportive, and loyal. When I think back to the clients that I've worked with over years or decades, many of them actually happened to be Amiable. If you can continue to do the right things, and obviously act with the integrity and authenticity that you should be doing anyway, you'll have the loyalty of the Amiable customer for a long time. Give them time to process decisions and situations, versus asking them to take a hard position or a vote. They're conflict-averse, so avoid putting them into an ultimatum position that's going to make them uncomfortable. Don't impulsively draw them into situations just to get their opinion, especially if they have no role in the outcome, they're going to want to think about it in advance. On that note, give them some advance notice if their thoughts and ideas will be asked. If you know that you're going to have a meeting, send your purpose, process, payoff in advance, which is always a good idea anyway, but send your agenda in advance, any kind of reading materials. They genuinely value being asked, but need the time to consider the people, the information, and the consequences before they respond. You won't get their best thinking if they're under pressure. How about you, Tim? What are some of the tips that you have? Tim Deuitch: 11:37 Let's start with, what's the language you use with an Amiable client? They like to use words, they're more receptive to words like support and help, and reputation. Susan Hall: 11:52 And team. Tim Deuitch: 11:53 Yes, and team, and so forth, and the word feel. Even if you're suggesting an idea, or sending them a proposal, using the language of, "Would this help you advance this in your company or in your organization, how does this feel to you, how does this idea land with you, how do you believe this would resonate with others?" That language helps convey to them that you understand that they're going to filter the impact of this conversation, of this idea. They're going to filter the impact of that through others, not through their own unilateral mindset that says, "Do I like this or not?" It's also helpful to help them understand why this is important, because the better they understand why an idea or a product is being presented, the easier it is for them to convey to others why. A very important thing. The last thing I'd add is that it's so helpful to tap into their insights because they filter ideas and concepts through the ways others will think about them. Don't fight it, ask them to share the pulse of their workplace with you, and share the pulse of the influencers, and consistently be asking, "How will this land with others? Will this help others make the decision that they need to make?" And so forth, so embrace. Susan Hall: 13:45 That's a great tip. Tim, as with every style, there are misconceptions about the Amiable customers. We all make judgments and from a cautionary perspective, Amiables, as we've discussed, can sometimes appear to buy into something because they want to avoid conflict. When in reality, they're not fully committed, and as a salesperson, you may feel blindsided. So, it is important to take the time to personally confirm their comfort, and ask for a commitment. I think there's also a misconception that Amiables are indecisive and lacking urgency. In fact, one of my clients is an Amiable, and several of her colleagues have said to me, "When you needed something done, give it to Jane. She just gets it done." It's not that they're lacking urgency, it's just that for them to feel comfortable making the right decision, there's some information that they need to gain, and that's the perspective of their colleagues. Can you share a common misconception or misunderstanding when you think about Amiable customers? Susan Hall: 15:40 How could you not love cheese? Tim Deuitch: 15:43 Well sure, and so the misconception that her company had is that as he looks at a cheese, a new cheese, it's brand new, it's brought in from France, and it's delectable, and he said, "This is fantastic." Then they began to even get to the point where they're talking about how much will we need, and how much would we manage, and how do we fulfill this across all of your stores. All the way down to the details, and guess what, after that happened, crickets. The reason was because he had to make sure that this product made sense to all dozen stores. The misconception again, I may be repeating myself, but it's very important. The misconception is that buy in on the front end does not mean buy in all the way through with an Amiable. In her case, they ended up not actually getting the sale, because he finally came around and said, "Well, this isn't something we ended up being able to do storewide, and so I've decided to delay." Susan Hall: 16:55 Yes, well interesting. Let's summarize, Tim. We've covered a lot today, the Amiable client is a people focused style that highly values relationships, collective input, and involvement, and a supportive, cooperative work environment. They work hard and they want to be appreciated for their accomplishments. They can be very loyal, especially as they establish relationships with suppliers and colleagues, and these relationships are best formed via recognition of them as people with feelings, certainly, as well as their contributions to their work. In fact, feelings may be as important as data in their decision making process. Help them help you by giving them time to process, inviting their opinion and input, and consistently checking in on how they're feeling about decisions in situations. If you gain and maintain their trust, Amiable clients are highly loyal, caring, flexible, and enjoyable to work with. Tim and I thank you for listening and we invite you to keep the conversation going with your questions, comments, and thoughts. To weigh in and learn more, please visit us at StrategicEnhancement.com.